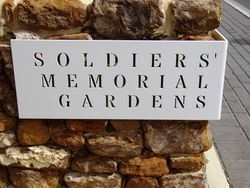 The Soldiers Memorial Gardens were established in memory of the soldiers from the district who died in service or were killed in action during World War One. The town planner (Mr. Chas C. Reade) has prepared a comprehensive plan for the development of a large area of the foreshore at Victor Harbor for public use and recreation. Mr. Reade recently conferred with the corporation, which has adopted his plans for the improvement of the soldiers' memorial gardens and their extension. A large obelisk of rough-hewn west island granite will be erected in a central place as a permanent memorial. The design includes rustic arches, creeper towers, and benches also a plantation of Norfolk Island pines. Each tree will he dedicated to and named in memory of a fallen soldier. Daily Herald (Adelaide), 8 March 1918.